What's popular in wine, what’s emerging, what’s on the horizon. To promote wine more effectively and profitably. Convert servers into wine sellers with timely wine training how-to's. Meet sommeliers and wine directors behind some of the most dynamic wine programs in US restaurants. By price category, from major wine regions and varietals, by the best palates in the wine business. Wine types/categories making in-roads on-premise. For 30 years Restaurant Wine has been offering exclusive wine recommendations, restaurant industry profiles, wine training tips, wine service suggestions, and wine trend commentary for cutting-edge restaurateurs, distributors, importers and exporters, wineries, wine shops and discriminating wine drinkers. 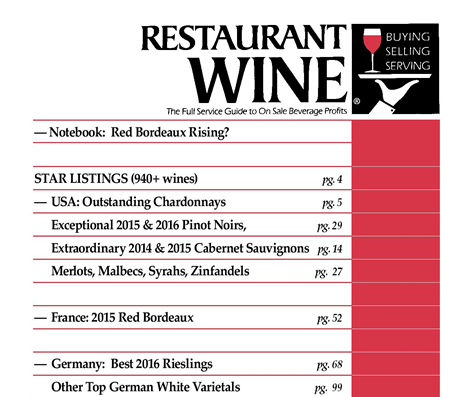 As the world’s leading wine newsletter for the restaurant and hospitality industry, Restaurant Wine reaches businesses and individuals throughout North America as well as countries in South America, Asia, Europe and Africa. It is only available electronically, by PDF. Restaurant Wine also provides wine consulting services to the wine trade and to consumers on all aspects of wine. Restaurant Wine is published and operated by Ronn Wiegand, the first person in the world (in 1991) to hold both the Master of Wine and Master Sommelier titles. Take my word for it, Restaurant Wine is indispensable! Every issue addresses the issues we face in buying and selling wine on-premise. Bottom line results? You betcha! Can you afford not to be tapped in? Restaurant Wine is extremely impressive in its clarity, breadth of restaurant wine-related issues and information. As a wine, I would describe it as concentrated, complex, subtle, with length and finesse, and intriguing enough to want another glass (issue)! I would give it 5 stars. The 'right on' marketing information we find in Restaurant Wine helps us help our restaurant accounts sell St. Supery. Ronn Wiegand's insight into the needs of the restaurateur, articles on what's working and previews of upcoming trends, lets us provide our accounts with so much more than just wine. Restaurant Wine should be required reading in every restaurant with a wine program that aspires to being taken seriously. For that matter, in any restaurant that aspires to greater profitability… I’d be willing to bet that implementation of any of the ideas in a typical issue would pay for the subscription price in added profits within a week. Dining Group South recommends that all general managers read Restaurant Wine. It is an excellent barometer of present and future trends in wine marketing. The various wine programs featured show marketing concepts in action, which is a great way to learn what works–without the potential pain of failure. For any wine buyer interested in running a successful wine program, or one who just wants to drink a great wine, Restaurant Wine is a MUST READ! Intelligently written editorials, plus Ronn Wiegand’s wine reviews that spring from his infallible palate make me virtually devour every new issue. Who’s selling wine? Where? How? It’s the marketing ideas that make Restaurant Wine so valuable to me. The concepts here can be as easily applied to my business as to a restaurant. I eagerly await the wine recommendations in Restaurant Wine. They’re consistent, concise, and more congruent with my taste than the ratings of any other review. Bravo! Bravo! And Amen May others copy your excellent and very consistent methods of evaluating wines. Restaurant Wine is informative, helpful and a damn good read for suppliers, too. - VP, Director of Marketing/Advertising, Freixenet USA, Inc. Your articles on how to sell wines on-premise are helpful tools we as a distributor can use to advise our clients on different ways to promote and increase their wine sales. Excellent publication. Fair, concise, informative and thought provoking. The wine reviews are excellent. Everything else is better. The restaurant profiles are particularly useful, in that they provide concrete examples of what works. Restaurant Wine is the single best way we have of getting a picture of what’s happening across the nation [in restaurants].